A long or extended playing release by Chronixx has been a potential red letter day in the reggae freak’s calendar from at least late 2012. And, after keeping his cards unusually close to his chest in interviews, the announcement of the cool head on young shoulders’ first proper project came rather suddenly: with just 2 weeks’ notice via a Soundcloud of health food related dancehall single Spirulina. So it is with a sense of some relief - yet not a whole lot of disbelief - that his debut statement over ten tracks (two old, five new, three dubs) is every bit as impressive as the hype ideally ought to beget. The opening two tunes are roots, known and elite. Alpha and Omega, built by Jammys son John John, with its sample of Al Campbell’s You Jamming, ploughs the early 80s furrow that fellow reggae reviver Protoje’s mined since his album 8 Year Affair. Thumping, all conquering tune of 2013 Here Comes Trouble is wisely positioned in the “now we get serious” spot as the second song. Then it’s on to the fresh cuts: the colonialism-smashing roots of Capture Land (produced, like Trouble, by Overstand JA) and the skinhead reggae renewal of Wheel Out by Special Delivery (reminscent of the Pioneers Long Shot Kick The Bucket). So far, so great. But if someone was hearing Chronixx for the first time and didn’t know how versatile he can be - it might seem that few risks were being taken in terms of doing something new (“A Europe thing that”). Fortunately, Special Delivery follow up with the contemporary one drop of Eternal Faya – possibly the strongest inclusion. Then we leave traditional reggae altogether for up-tempo culture and hip hop hybridity with Zinc Fence’s aforementioned Spirulina and Like A Whistle. Each segue is perfect and arrives just in time to take proceedings to the next level: including the coda when the three most rootical tracks – Alpha and Omega, Here Comes Trouble and Capture Land - melt into dub. People talk about “singjay” in reference to any deejay with a passable note hit ratio. Here Chronixx is a singjay in the sense that he is a singer who delivers in the deejay pattern (like Ini Kamoze - who he is known to mimic on stage). Comparisons to I Wayne proved superficial - as Chronixx is way more relaxed in his delivery than the hot milk voiced Wayne could ever be. Quality control has been the name of the game for Chronixx singles-wise and he continues it here. 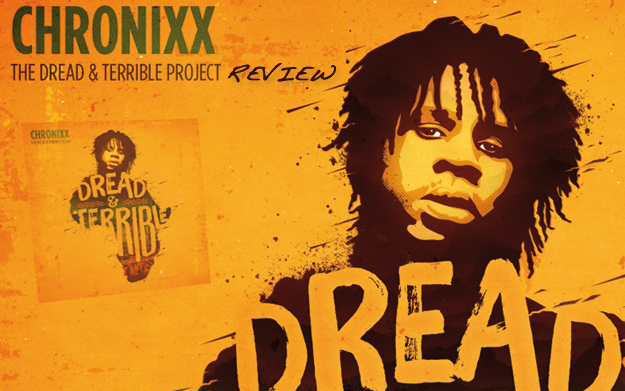 But unlike, say, Alborosie whose initial run of consistent 45s never strayed far past the Sly & Robbie playbook, Chronixx is diverse enough that we can be sure that the best, in the form of an album and perhaps many more, is yet to come. A rock solid sequence from start to finish, that stands up to being rotated on repeat. Dread and Terrible indeed.